This article was written by Cam Fortems of the Kamloops Daily News on January 3rd, 2012. The average property assessment in Kamloops declined slightly in 2011, the first time values have gone down in a decade. Homeowners began receiving notices Tuesday from B.C. Assessment Authority. Graham Held, deputy assessor for B.C. Assessment Authority, said the numbers show a market that’s largely unchanged from a year ago. 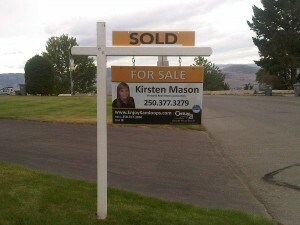 The market value of all single- and multi-family homes in Kamloops declined by 1.46 per cent, measured between July 1, 2010, and July 1, 2011. The City of Kamloops will use that number to adjust its mill rate down. Property owners who see values decline more than 1.46 per cent will see a corresponding savings on their tax bill in June while those on the plus side will pay more. City council has also yet to set its general tax increase. In the big picture, Heid said the market has been largely unchanged for several years. “What we’re looking at for the City of Kamloops is it’s at about the same level, plus or minus five per cent,” he said. The assessment authority values homes at July 1 the preceding year. But Held said little market shift occurred in the past six months. Brian Ledoux, president of Kamloops District Real Estate Association, said the flat and slightly declining prices come as no surprise. They are in the wake of increases in the mid-2000s in property values of up to 20 per cent a year, in back-to-back years. Ledoux said he expects little change in the current trend. Last year the assessment authority calculated that property values climbed about three per cent on average. “We’re looking at slight, slow and steady increase of one to three per cent in 2012,” he said, noting interest rates remain near historic lows and show few signs of moving up. MLS sales in December in the City were up by seven per cent over the same month last year, something Ledoux said is a positive sign for the new year. Reflecting the assessment values, the association calculated the median price for a single-family home here declined a little more than one per cent, to $327,000 at the end of the year. One recent positive sign is a decline of 460 listings, bringing the number of homes for sale on the MLS to about 2,400. That inventory remains high by historical standards, however. “It’s good it’s (inventory) coming down. but it’s got some more room to come down,” Ledoux said. B.C. Assessment Authority tracks the market value of property as well as growth through building and subdivision. The latest roll growth of about $25 million is the smallest in the past five years. Roll growth between 2008 and 2009 was $1 billion, both from market increases and new development. Property owners concerned about their valuations must submit a notice of appeal by Jan. 31 in order to qualify for a hearing in front of the Property Assessment Review Panel. Hearings are set between Feb. 1 and March 15. Sahali and Aberdeen declined to an average of $404,000, down about $6,000 from the year before. East Kamloops (Valleyview, Juniper, Barnhartvale and Dallas) up to $392,000, an increase of $4,000. Batchelor Heights increased by $7,000 to $374,000. North Shore (Brocklehurst and North Kamloops) decreased $3,000, to $303,000. Property values in neighbouring municipalities were also typically down or flat. The largest decrease was felt at Sun Peaks, where values stayed the same or decreased by as much as 15 per cent.